Preheat the oven to 200°C, gas mark 6. Roll out the pastry and use to line the base of a 24cm loose-bottomed, fluted flan tin. Bake blind for 12-15 minutes until the pastry is golden and crisp. Allow to cool. Place the butter and sugar in a heavy-based pan and beat together with the eggs and yolks, until blended. Whisk in the zest and juice of the oranges. Place the mixture over a medium heat, whisking continuously for 4-5 minutes until it starts to thicken, then stir in the cranberries and 100ml of the cream. Boil for 1 minute, stirring continuously (do not boil for longer or the mixture will curdle). Pour the mixture into the pastry case and chill in the fridge for 3 hours, or overnight, until set. Just before serving, sprinkle the top with the sugar and cover the edges of the tart with foil. Place under a grill until the sugar melts and caramelises. 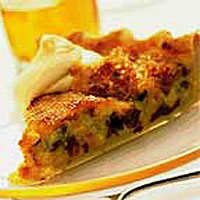 Serve the tart in slices with the remaining Cointreau cream. The trifle can be made up to 24 hours in advance without the cream topping. Keep covered in the fridge, then top with the cream to serve. Enjoy with the sweet Brown Brothers Late Harvested Orange Muscat & Flora 2002 Victoria, Australia.